Elizabeth Ellcessor – access. media. disability. Elizabeth Ellcessor is assistant professor in the department of Media Studies at the University of Virginia. She is the author of Restricted Access: Media, Disability, and the Politics of Participation, the first cultural analysis of Web and digital media accessibility for people with disabilities. With Bill Kirkpatrick, she is editor of Disability Media Studies, a teachable collection of essays from scholars in media, disability, and literary studies. 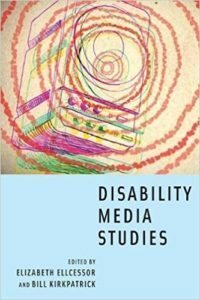 This book posits the emergence of disability media studies as a rich, interdisciplinary field of study with far-reaching implications for how we live in, study, and teach about today’s media saturated lives. She is currently conducting research on emergency media, including 911, campus blue light phones, LifeAlert and similar personal emergency response systems, and a host of smartphone apps that offer to replicate, combine, or replace such media services.